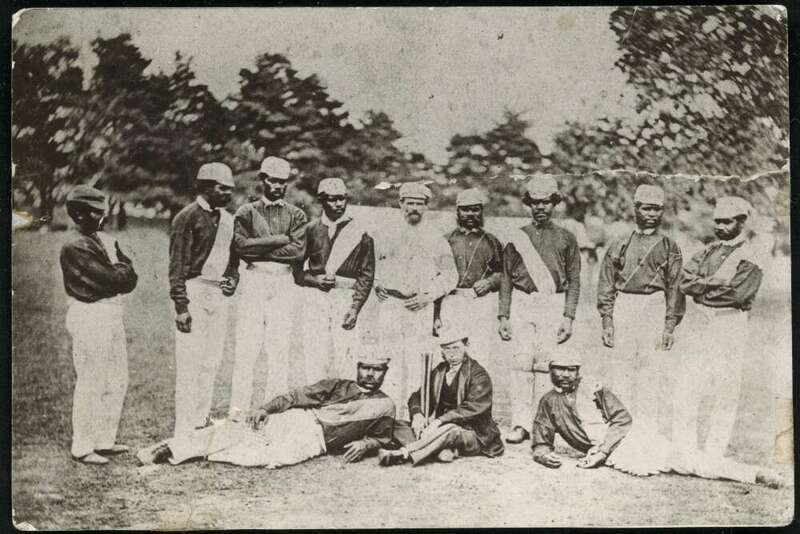 In 1868 Australia’s first cricket tour of England took place as a team of Indigenous Australians headed off to England to represent their country. 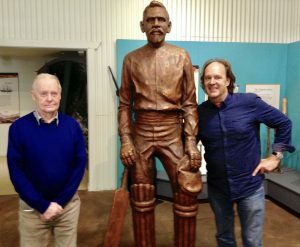 Mark Greenwood, author of Boomerang and Bat: The story of the real first eleven, writes about this important moment in history and how his book, illustrated by Terry Denton, came about. 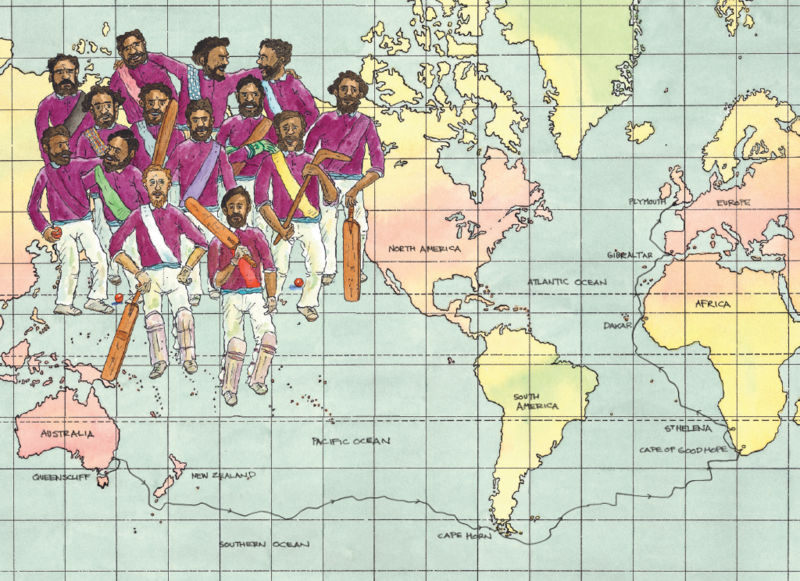 150 years ago an Indigenous cricket team set off on a secret journey across the world to take on England’s best. It was the first time an organised sporting group had travelled to England as representatives of Australia. Despite being denied permission to travel overseas (the Board for the Protection of Aborigines objected to them leaving the colony) the team impressed sporting critics with their exceptional talent and won the hearts of spectators. 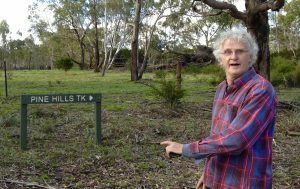 The team consisted of Indigenous men from the Western District of Victoria, coached and captained by an ex all-England cricketer, Charles Lawrence. Between May and October 1868, they played 47 matches. The first, at the Oval, drew 20,000 spectators. The standout player was Unaarrimin. His station name, Johnny Mullagh, was drawn from the name of the one of the properties where he worked as a shearer. Leading his team on foreign fields, he completed 71 innings, scoring 1698 runs, bowling 1877 overs and taking 245 wickets. 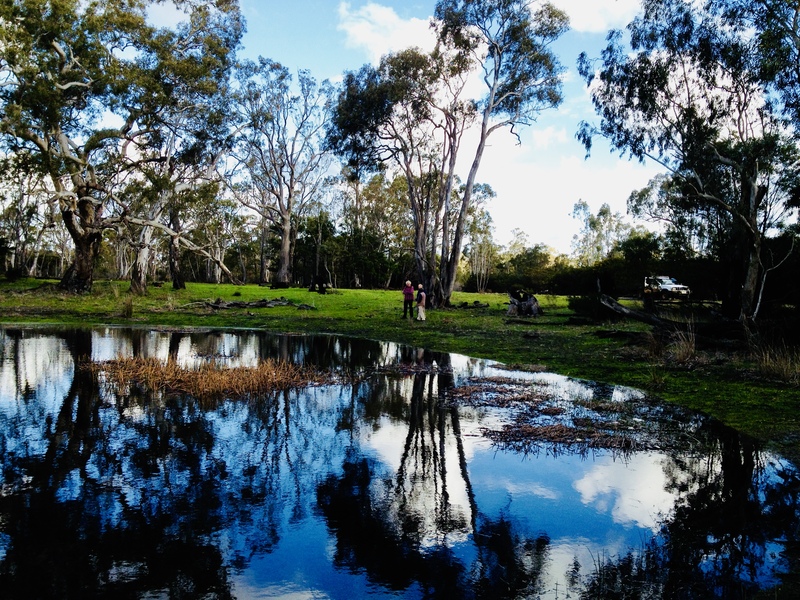 To build the foundations of Boomerang and Bat, Terry Denton and I traveled to Harrow, Edenhope and Lake Wallace in the Western districts of Victoria, where the story began. 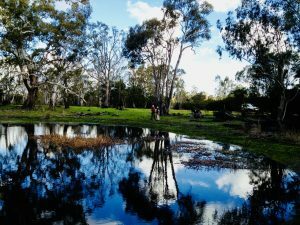 The West Wimmera cricket trail was our starting point. At the Harrow Discovery Centre we found the team’s replica coloured caps that bore the emblem of a silver boomerang and bat. 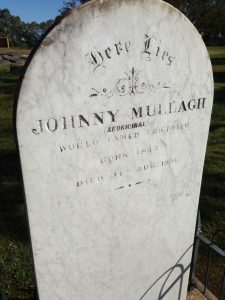 At Johnny Mullagh’s grave, ideas were discussed. At the waterhole, where Unaarrimin spent his last days, the book’s structure was hammered out. What we found on our travels was more than a cricket story. The original heroes in Australia’s sporting history sought neither fame nor glory. They received no reward for their success, but instead returned to their old lives and to relative anonymity. 150 years on, they deserve the nation’s recognition. 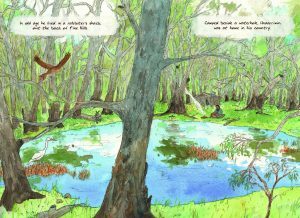 When our research trip was over, our author/illustrator roles became separate. The text was written and rewritten, revised and reworked. Terry’s initial rough sketches added clarity to the storytelling. 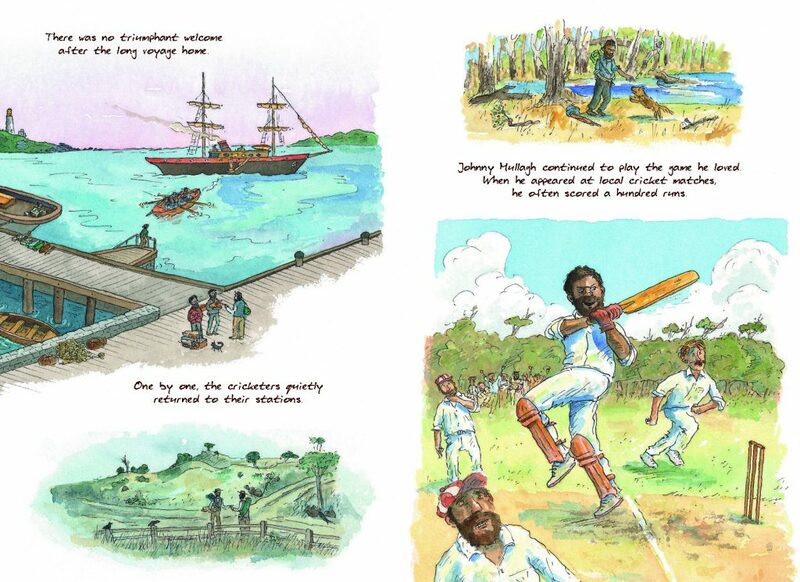 In the spaces between text and pictures we hoped readers would find layers of meaning and whispered questions about the ‘game for all Australians’: With all its global success and influence why have so few Indigenous players represented their country at a sport that has engaged the nation for 150 years? Why have the real First Eleven never received the recognition they deserved? Why are so many Australians unaware of their achievements, when we hold sporting achievement on the world stage in such high esteem? 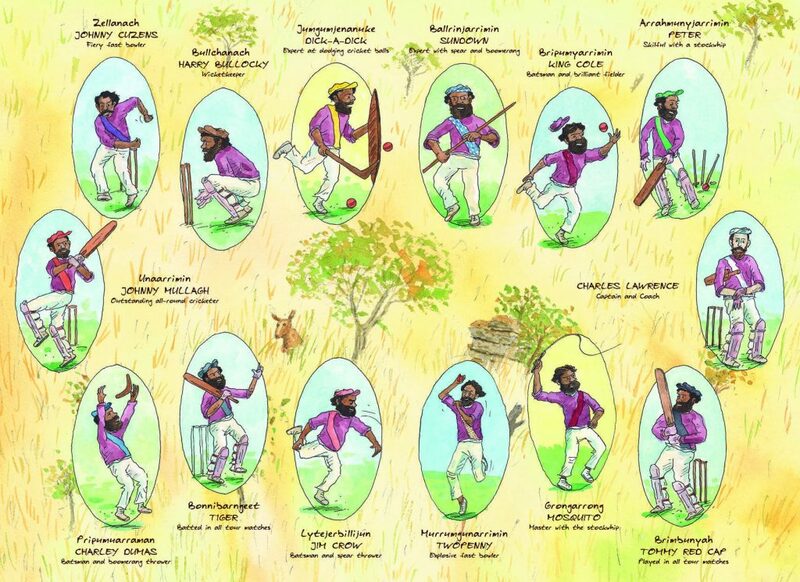 What Terry and I were striving for was a book to educate readers and to raise awareness of the historic ties between Aboriginal people and the game of cricket. We hope our book helps to address a gap in our nation’s sporting history. For Terry and I, Boomerang and Bat is a long overdue act of recognition.